In 2 separate bowls, add 1 cup boiling water to each packet of flavored gelatin. Stir until gelatin is dissolved, then stir in 3/4 cup of vodka into each bowl. In 3 separate bowls, add a 1/4-cup of cool water into each bowl, followed by a package of unflavored gelatin, allowing the gelatin to absorb for about a minute. Add 3/4 of a cup of boiling water into each bowl, stirring until gelatin is dissolved. In one bowl, add 4 tablespoons of crushed gold sprinkles, then 4 tablespoons of crushed silver sprinkles in another, and 2 tablespoons of sweetened condensed milk in the last, stirring until dissolved. In each bowl, add 3/4 of a cup of vodka. Line shot glasses on baking trays, to make them easy to store in the refrigerator. Using 1.5 ounce shot glasses, add about a tablespoon of gelatin mix into each glass, refrigerating for 20-30 minutes, until set, before adding the next color. Repeat this until you have completed all five layers. Refrigerate an additional 3 hours, or overnight. Have some toothpicks besides the shots when serving, this way, if you have issues getting them out, you can take a toothpick and run it along the sides of the shot glass to loosen the jello! Endless lines. Carols on repeat. Eating your weight in cookies. These jelly shots will make everything better. It's the holidays. Everybody wants gifts, I'm broke. I hate the mall, parking is a disaster, I'm always single (just kidding, I'm not actually single). I liked Christmas music – UNTIL I KEPT HEARING SANTA BABY EVERY 5 MINUTES!! Not to mention how many pairs of new pants I'm going to need after gorging on holiday dinners! Okay, I'm not actually that miserable about the holidays. But if that was starting to sound a lot like your thoughts around this time of year, then you need some help. That help comes in the form of alcohol and gelatin – a whole FIVE layers of it! 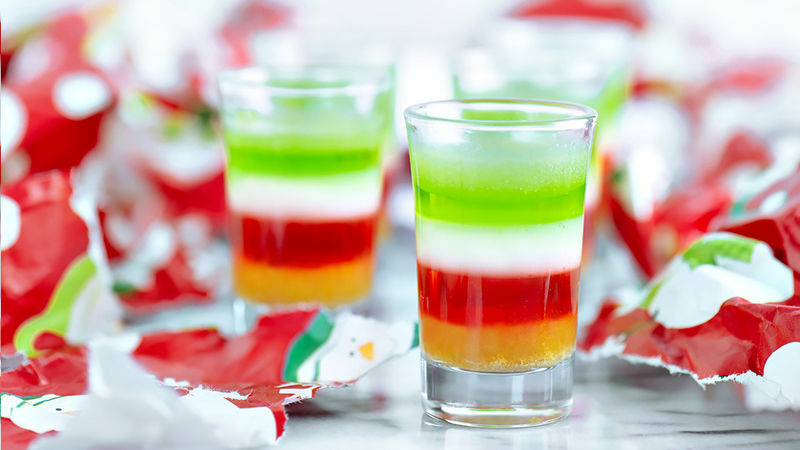 Say hello to the 5 Layers of Holiday Stress Jelly Shot, one wonderful layer for each one of those warm and fuzzy holiday feelings you're starting to get! Start off by getting all of your shot glasses lined up on baking sheets (this will make it easier to transfer in and out of the fridge - and you can stack them!). This recipe makes around 60 shots, so get ready to have some fun! In 5 separate bowls, mix the gelatin and vodka for your 5 different layers. Once you've mixed everything, start with your gold layer, adding about a tablespoon of the mixture into the shot glass (this will create 5 nice even layers in a 1.5 ounce shot glass). I recommend using a small funnel when pouring each layer to keep everything nice and clean. After pouring each layer, let it set in the fridge for about 20-30 minutes. Once you have completed the jelly shots, refrigerate them for an additional three hours, or overnight. When it comes time to serve your shots, I recommend putting out a bowl of toothpicks. If the shots have trouble coming out, then you can just quickly run a toothpick around the edge of the glass to make it easier to pop out. After a few of these shots your holidays will definitely be happier!